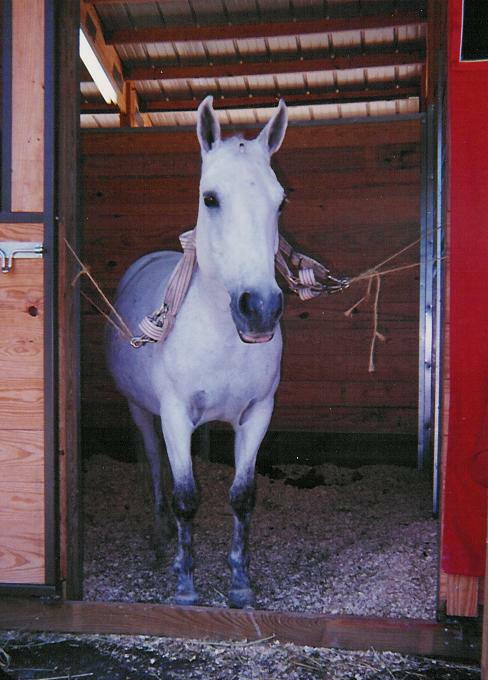 McGinnis is a 1988, 13.3 hand grey mare from the Camus John bloodlines. 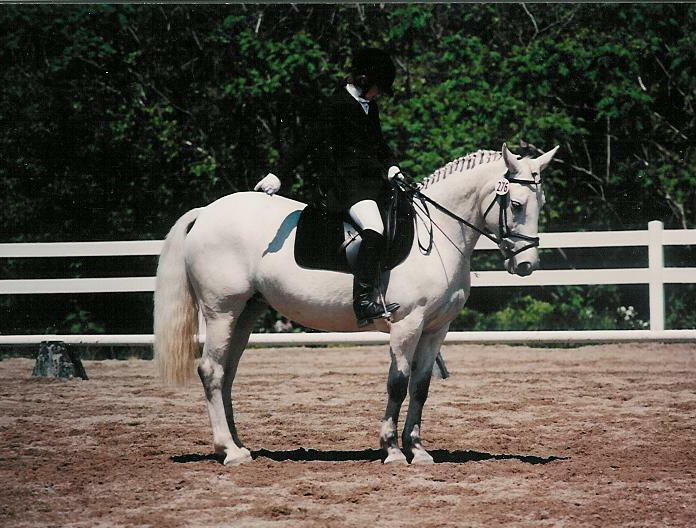 She entered the dressage show ring for the first time in 2000. 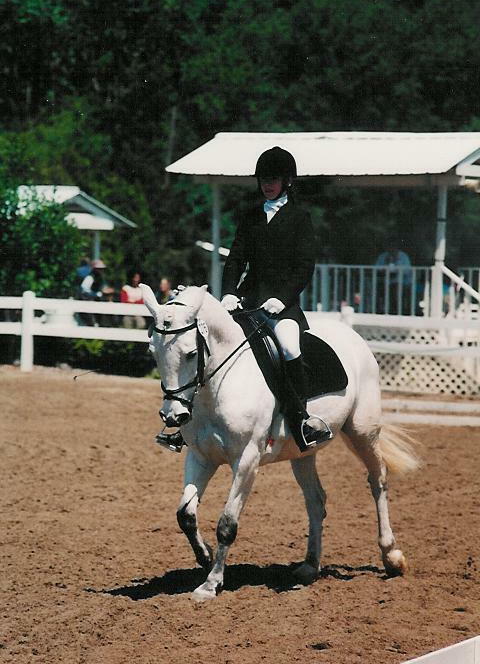 She qualified for USDF Regional Championships in her first year. She came in 9th at training level for the 9 state region. She also was USDF All Breed winner at both training and first level with her young rider Courtney Yeager. McGinnis was inspected and approved in Sept, 2003. McGinnis was the queen of the show grounds. She developed quite a fan club where ever she went. Her laid back attitude about the whole scene, combined with her go get em attitude in the show ring proved to be the perfect combination. She loved to be at the show grounds. Very often she would escape from her stall and someone would lead her back by her forelock. McGinnis's enthusiasum was contagious. McGinnis viewing her world from her pedestal. She achieved second level prior to her retirement from the dressage ring. She was bred to Landgates Bluebeard and produced a 2003 lovely gray colt, Lougin's Aragorn. 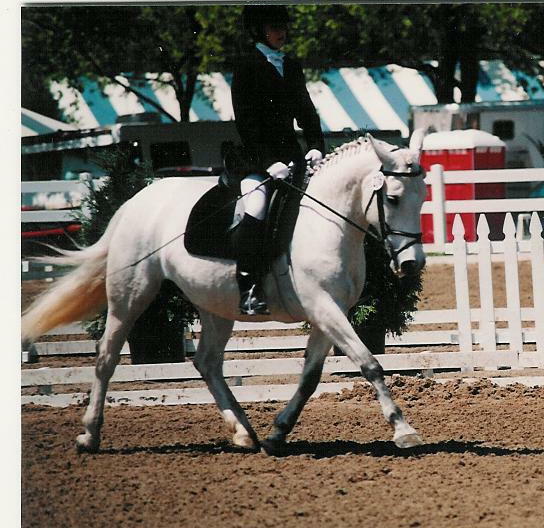 "Conor" was sold to Vickie Maris in Indiana and has been in training at Findley College. She was also bred to Hannovarian, Goldluck and produced a lovely bay colt, Giddeon, in 2005, who is destined to be Courtney's next dressage project.